When clients select a design/build or custom process with Structures, our job and joy is to cater to the needs and desires specific to their building process. We love taking care of all of the details and over the past 10 years of being in business, we have gained an impeccable reputation for building for the local and out-of-town clients. Our goal is to give each client a building experience where they can love and enjoy the process, and be led with their own on-staff, Design Manager, through the many details that make their home truly custom. When Mr. and Mrs. Kemp arrived at the Charleston airport to visit their Daniel Island Park custom home, they were greeted with the downpours to our beautiful Charleston. 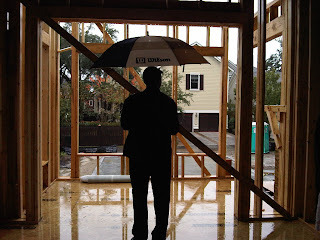 No worries though, the rain wasn’t going to rain on our parade… We simply gathered up the golf umbrellas and toured around inside their roofless home answering questions and making little changes to the plans… again, some of the benefits to the custom build process, if we’re able to make something happen, we’re happy to figure out a way to do it!